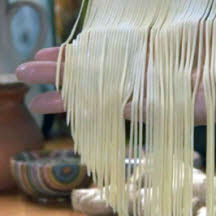 Making fresh pasta is an age-old process that every home cook should know how to do. It's simple, fast and fun—and homemade noodles take just a minute to cook! 1. In a stand mixer with a flat beater attached add flour and salt. 2. Set the mixer to stir and mix briefly. 3. Add eggs and mix until the dough forms into a ball. 4. Remove the dough and wrap in plastic wrap and let it rest for 20 minutes before working with it. 5. When the dough has properly rested cut it into 4 equal pieces and flatten each piece slightly. 6. Attach the pasta roller to your standing mixer start to work your dough through one piece at a time. 7. While running the dough through, fold it into thirds to make the edges even. 8. Repeat this fold and run through the roller processes 3 to 4 more times. 9. Run the dough through without folding once, this will help make the dough more consistent and elastic. 10. Run the dough through each level from 1 to 9. This will give the dough a toothsome texture. 11. Once the dough is thoroughly worked and flattened out you can attach your desired pasta cutting tool. 12. Set to speed 4 and run the sheet of dough through the cutter. 13. Lay the cut pasta down and sprinkle with flour giving it a little toss to coat. Instructions provided courtesy of HolidayKitchen.tv. Photograph property of CooksRecipes.com.